Remember the last time you had a crisp dosa? As the morsels disappeared into your mouth, you probably would have said a word or two in praise of the cook for getting the rice-black lentil batter into the perfect proportion. But would you have credited a few anonymous little creatures for this culinary dexterity? The microbes, bacteria and yeast that worked tirelessly on the batter for about a day-and-a quarter giving the dosa lots of nitrogen, soluble proteins, reducing sugars and enzymes? It's they who made your snack fluffy and tangy. The English language terms their labour as fermentation. Today probiotics take inspiration from traditional fermented foods. But even at its best, the industry cannot offer either the variety or the taste created by traditional cooks and their tiny foot soldiers. And of course, traditional fermented foods are much cheaper. Most times, as in the case of dosa batter, raw materials provide microbes.Yeast granules easily available in the market are also good fermenting agents. Jyoti Prakash Tamang, food microbiologist at Sikkim Central University, Gangtok says "Some microbes help in bio-preservation of perishable vegetables, fish and meat products." But he adds that adding synthetic compounds to preserve foods affects fermentation. Shikha Sharma, a dietician from Delhi points to another significant quality of fermented foods--foods worked on by microbes are easy to digest. Her favourite fermented food is khandvi, a nutritious gram flour cake. Khandvi, she says is good for people on a diet regime as it does not lead to weight gain. Heat busters In Haryana during the harvest season, March and April, a fermented form of bajra, rabadi, is used as protection from the sun. It consists of crushed bajra seeds soaked in buttermilk (seet). The mixture is cooked well and left overnight. The does not change the food's fat, protein and mineral content but makes it less acidic. Other fermented foods also have medicinal uses. Dahi is said to check diarrhoea. Nutritionists say it regenerates damaged gut epithelium. "Fermentation converts lactose into glucose and galactose, which is easily digestible by even the lactose- intolerant. Also, milk does not have essential vitamins like B1, which bacteria in the curd provide," says P R Sinha, National Dairy Research Institute, Karnal. But fermenting is time-consuming and is slowly losing its place in homes. Food companies have come up with packaged versions of idlis and dhokla. The friendly microbes do not work on these versions. K Sudha Asokan, director of Ayurveda Centre, a private clinic in Delhi, says that idlis are the best breakfast food, especially for those with stomach ailments. Unlike other fermented foods that require baking soda, the idli batter ferments on its own. It has the right combination of carbohydrates and proteins. Even diabetics, who otherwise need to restrict their carbohydrate intake, can consume a limited amount. Take rice and urad lentil in equal proportions, soak it for some time and then grind it. A stone grinder is best for the purpose. The urad should be made into a fine paste but the rice needs to be ground a little less. The batter should be left to ferment overnight. Next morning, steam the batter in an idli cooker. Enjoy with either coconut chutney or sambar. Priya Nair works in Centre for Environment Education in Ahmedabad and loves the local fermented food, dhokla. She thinks that a variety of pulses used in preparing dhokla make it an ideal snack. What's more, she says making dhoklas requires very little baking soda. Besides being nutritional, it is also very tasty and filling. Vegetables like lauki (bottle gourd) can be added to increase the nutritional value. Grind equal portions of rice, urad and moong. Take cup of the batter and mix it well with three cups of buttermilk. Ferment to 4 to 5 hours. Though baking soda (mixed with oil) can be used, this can be avoided if hands are used to mix the batter--body heat hastens the process of fermentation. Add green chilli, ginger and salt and pour in a greased plate. Steam the mixture and sprinkle red chilli powder and coriander. Steam again for a few minutes. Cut into pieces and enjoy. The "not so low" on calories food, the jalebi is said to have originated in Arabia and brought to India by the Mughal rulers in the 16th century. People usually do not make this at home but the sweet is likely to be available in your neighbourhood sweet shop. 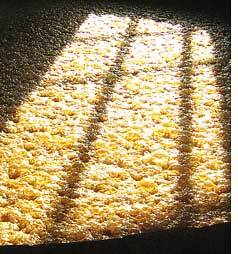 During fermentation pH (the acidity) of the batter decreases from 4.4 to 3.3, but so does nitrogen and free sugar. The main bacteria involved are Lactobaccillus fermentum, L. buchneri, Streptococcus lactis, S faecalis. The sweet uses refined flour and curd. These are mixed with a bit of salt and fermented for 24-36 hours. The batter is then squeezed out of a cone in hot oil and fried. They are then dipped in sugar syrup. Saffron and cardamom are sometimes used to garnish. According to PR SInha of the National Dairy Research Institute, Karnal, dahi reduces the levels of fasting blood glucose, insulin, free fatty acids and triglyceride. Many, many microbes are involved in this effect. In Bangladesh, a total of 266 strains of lactic acid bacteria were isolated from 28 Dahi samples. 50 per cent of them belonged to different species of the bacteria Streptococcus and 27 per cent belonged to Lactobacillus. Yogurt, not to be confused with dahi, uses only Lactobacillus culture. Companies coming up with probiotic dahi in India use only Lactobacillus. Cool boiled milk, mix a little curd into it (the correct measurement is 1 per cent of the milk but at home, one generally takes a teaspoon ), and do not disturb it for a few hours.